DEAL FELL THROUGH! 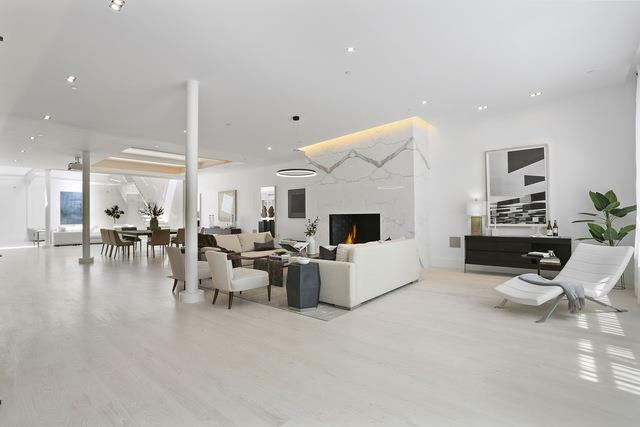 BACK ON MARKET w/ $1.5MM PRICE REDUCTION NEW ~6000 SF PENTHOUSE w/POOL + ~4000 SF PRIVATE ROOF TERRACEHere is the freshly created, designer dream PENTHOUSE LOFT that sets a new standard in downtown living a shining star, new development condo loft atop an historical loft building. Unfolding dramatically before you is something unique there is nothing else like this in NYC: A sprawling condo with ~6000 SF interior space plus ~4000 SF of exterior living space, including 2 rooftop skydecks with gorgeous sky and city views, private pool area, barbecue and fire pit. 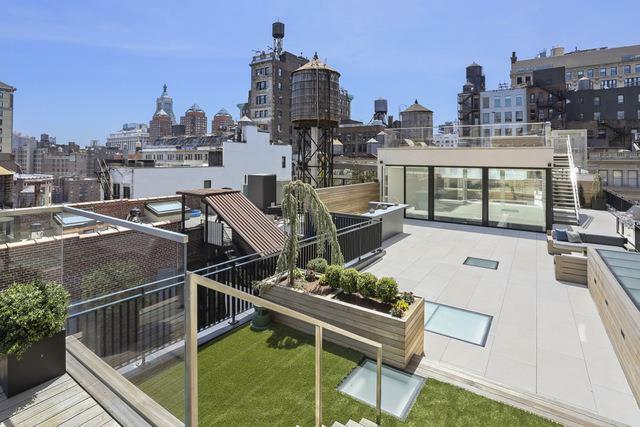 Spanning an entire block from 17th to 18th Street, this 5-star, floor-through penthouse boasts a fantastic layout, with 4 bedrooms, 4.5 baths, 2 private keyed elevator entries, video surveillance, all in a world-class, super-convenient location. 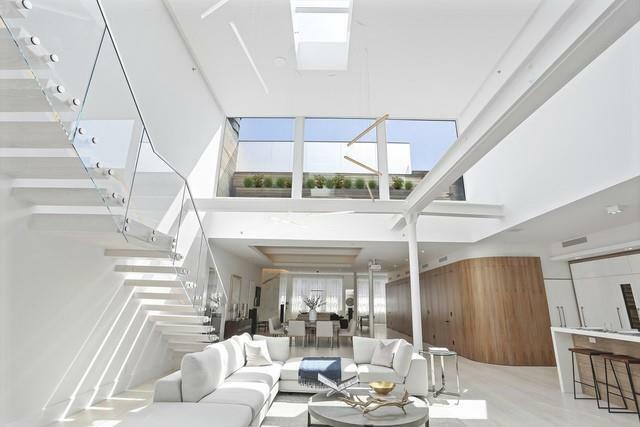 The penthouse boasts exceptional light, with 20 oversized windows on 4 exposures, 12 to 25 ceilings, and 16 skylights. 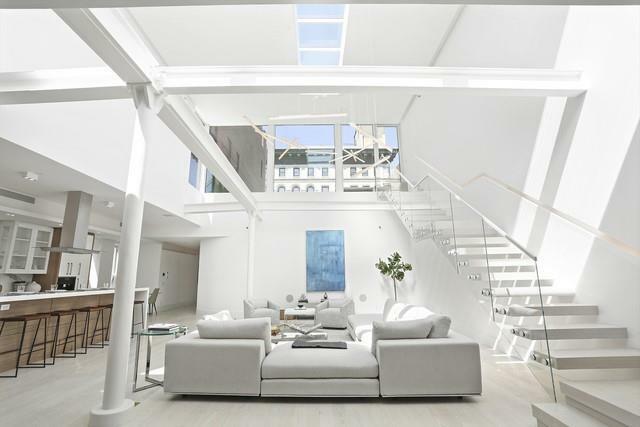 Brilliantly situated between 5th and Union Square, in one of the area's most coveted boutique loft buildings, this one-of-a-kind is both dramatic and comfortable inspiring and relaxing a rock-star space in which to live large, yet privately. The elevator brings you into a fantastic 50 foyer opening up to reveal an 80 " 30 living/dining/media space making for a grand first impression. Features include: -Over-Sized Living Room: Features 12' ceilings, 30' Southerly window wall with electronic shades, and Statuary wood-burning fireplace that makes a statement. -50 Foyer Hall trimmed in bleached Walnut, accented with soffit up-lighting, concealing 20 of closet space, full sized laundry room, and technology closet. - Screening Area: Featuring the latest technologies, a hidden 100" electronic screen, a custom coffered ceiling, and specialty lighting. -25 High Glass Atrium Great Room (or Dining Room), with 16' long skylight, exposed high gloss beams. Open to kitchen for easy entertaining on a grand scale. -Custom Bakes Kitchen: This white, high gloss masterpiece, accented in bleached walnut, offers an oversized, monolithic Glassos Island with seating for 6, full-size Subzero refrigerator, freezer, and wine cellar, Wolf 8-Burner Range with Griddle, Miele Coffee System, 2 Bosch dishwashers, and a windowed Breakfast Area. -One-Of-A-Kind, Free Floating Stairway to Private Sky Yard: This custom crafted stairway is a work of art, with Glass Railings and Feature Lighting. -Limestone-Clad Roof Decks with Pool: Two-tiered al fresco dream space with ~3000 square feet of primary deck and a prized ~1000 sq. ft. additional elevated outdoor living room with glass railings and open views on 3 sides. The main tier offers a 20' stainless steel swimming pool with Olympic-strength swim current, outdoor shower, 16 walk-on skylights, full-size outdoor bar in Pietra Cardosa, full outdoor barbecue and lush landscaping throughout. -Art Gallery Hall: Features original exposed metal beams and a 25' long raised skylight corridor at 15' height. -4 En Suite Bedrooms including 2 Full Master Bedrooms: Each suite offers a spectacular custom 6-point Master Bath, and His/Hers Closet Space. -Full Windowed office possible, with its own elevator entry and private bath. A new standard in grand Penthouse living has been set with 10,000 square feet of indoor and outdoor living that would be nearly impossible to re-create.Your elevated world awaitsset above the backdrop of world-renowned Union Square Green market, the heartwarming Madison Square Park, a plethora of designer boutiques, and some of NYCs top destination restaurants.